This lesion presents as a slow-growing, well-circumscribed mass attached to tendons in hands and feet. The tendons of fingers, hand and wrist are most commonly involved. It starts as a fasciitis-like process which evolves into a hypocellular hyalinized nodule. 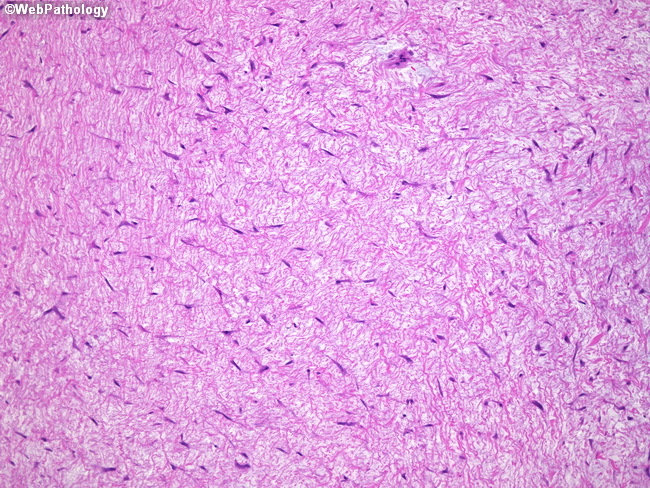 The image shows a proliferation of spindle and stellate mesenchymal cells in a collagenous background. Cytologic atypia (degenerative type) is sometimes present; however, mitotic activity is not increased.